rec. 24-27 May 2004, Klingenmünster, Germany. Schubert�s chamber music is particularly well served in the CD catalogues at the moment and I for one am happy with the increasingly wide choice available. Naxos and Kodaly have recently finished their complete survey of the fifteen string quartets. Now we have the second volume of the intended complete survey from the German-based Mandelring Quartet. 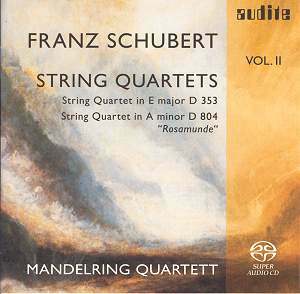 A few months ago I reviewed a Schubert string quartet double set from the Brandis Quartet of the: A minor �Rosamunde�; D minor �Death and the Maiden�; C minor �Quartettsatz� and the G major D.887 on Brilliant Classics 99288. Earlier this year I was delighted to tackle a Schubert four disc set from the Lindsay Quartet. That one comprised the: �Death and the Maiden�; �Quartettsatz�; �Rosamunde� D.804; B flat D.112; G major D.887 with the C major Quintet D.956 all on Sanctuary Classics Resonance RSB 403. The �Rosamunde� Quartet was the only one of Schubert�s four string quartets published in his lifetime. Composed in 1824 in the shadow of a fatal illness this brooding work also happens to be one of the greatest ever written. Known as the �Rosamunde� it reuses themes from the composer�s incidental music to the unsuccessful play; it serves throughout as an intimation of the pained memories of happier times. I admire the last movement marked allegro moderato showing as it does the composer�s wealth of invention. In the �Rosamunde� the performance from the Mandelring presents a secure ensemble yet I was often bewildered with their choice of tempos and the slight amount of passion they provided. Their opening allegro feels too measured and the tranquil andante lacks feeling and tends to lose its way. I also felt that additional vitality and intensity was needed in the third movement minuet. In the concluding allegro the Mandelrings seem reluctant to provide sufficient urgency and vigour, treating the music as if they were handling delicate porcelain. Consequently Schubert�s optimism and spirit never stands a chance of materialising. My ideal account of the �Rosamunde� is the version performed on period instruments by the eminent Quatuor Mosaïques on Auvidis Astrée E 8580. This is a compelling version noted for the quartet�s special playing where the personality of each member comes across so engagingly. The sublimely emotional second movement andante is played with remarkable sensitivity and poetry, to provide an intensely moving experience. Being familiar with the interpretation from Quatuor Mosaïques I can fully understand how influential music writer H.L. Mencken stated that this music was the proof he needed for the existence of God. Schubert�s String Quartet No. 11 was almost certainly composed in 1816. At this time in his life Schubert had been highly influenced by his teacher Antonio Salieri. He was also indebted to the works of Mozart and Haydn, especially in the field of chamber music, which they had elevated to become a touchstone of craftsmanship, sonorous delicacy and formal proportions. It was in this context that the teenage Schubert wrote this quartet, probably composed for his family. Its technical demands were far beyond the faculties of even gifted amateurs. The String Quartet No. 11 is a work fully conceived in Viennese classicism and demonstrates a growing self assurance. Immediate signs of greater maturity are heard in the opening of first movement marked allegro con fuoco, and the minuet combines the earthy stamping rhythm of contemporary dance with a sense of aloofness in the trio. In the final movement rondo Schubert lightheartedly alludes to the main theme of the final movement of Mozart�s Symphony in E flat major, K543 only to turn elsewhere immediately. In the opening allegro the playing of the Mandelring is tentative although small quantities of vitality are glimpsed. The slow movement andante is given a reverential reading that provides a suitable degree of expression. They once again seem wary in the minuet. I was content with their dynamics yet unfortunately there was insufficient forward momentum. The final movement rondo is adequately performed although I would have preferred more weight. Overall in these two Schubert string quartets the Mandelrings provide an adequate security of ensemble and their timbre is pleasing. Sadly, I experienced their playing as over-cautious, lacking the appropriate amount of vigour and exuberance, and the readings felt emotionally chilly. The annotation is acceptable and the Audite engineers have supplied an enjoyable sound. I do not have an alternative version of the E major Quartet that I am able to recommend. However, I hear good reports of the version from the Melos Quartet on their six disc set of the complete Schubert string quartets on Deutsche Grammophon 463 151-2.